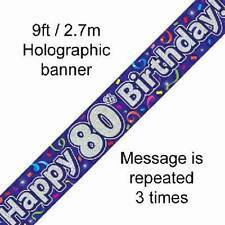 2 PERSONALISED BIRTHDAY BANNER x 2 18th 21st 30th 40th CHAMPAGNE 36" x 11"
2 PERSONALISED BIRTHDAY BANNER x 2 18th 21st 30th 40th CELEBRATION 36" x 11"
These banners can also be used as sashes! Material: Card. 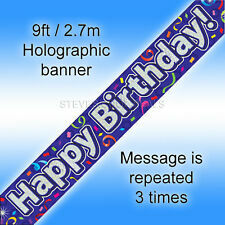 Width: 5.16 foot (1.57 m). The banner reads 'Happy 100th' in yellow and purple. Large "Look Who's Over The Hill" banner decorated with a cheeky vulture! Polyurethane plastic, so for use inside or outdoors. We will always help you to have a 100% positive happy buying experience. 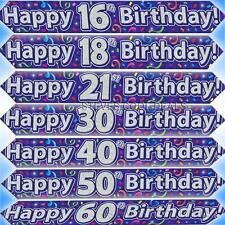 We also have other banners with ages ranging from 1 to 100. It is a combination of purple and yellow with holographic details making it really sparkly and eye-catching. Personalised GIANT Banner. Shout it out and stick it up for all to see and enjoy with this Jumbo sized banner. As a personalised item, it is important that you check the spelling and photo quality before approval of your proof. 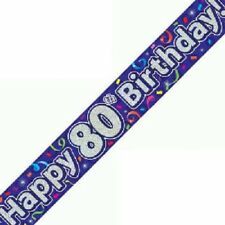 Size: 2.6m (Approx) The Banner can be cut into 3 design sections of 86cm (Approx). Already Personalised 50th Birthday Banner with the name Tina.